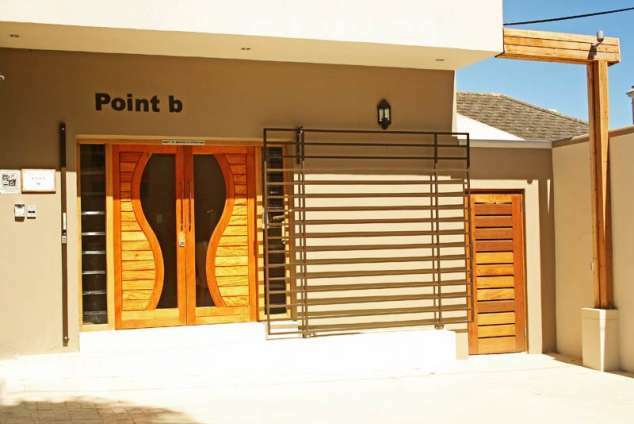 Point B Guest House - Green Point Accommodation. This Little Haven on the city boundary, is ideally situated to have a care free visit to the Mother City of Cape Town. An interesting walk through our Famous Fan walk, via the Green Point Village To the city Centre is a mere 25 minutes. A stroll down to the Famous V&A Water Front is a mere 15 minute walk from the guest house, stop and dine, or take in a movie, visit the aquarium where you find the first stop for the City sightseeing bus. Visit our city, see the City Hall. Visit Long street, where you will find quirky fashion shops and antique treasure troves. Amble down the city gardens (maybe have lunch or High tea at the Old Nellie (Mt. Nelson Hotel). Nostalgia and Olde world Experience. We are a hop away from the My Citi bus transport system and just a stones throw away from Sea Point, with its beach front promenade and ample restaurants to choose from. Clifton Bikini Beaches are a mere 15 min ,bus ride, soak up some sun, watch the beach goers or stroll down our Mini Riviera on Camps Bay Boulevard but don't forget the wonderful markets on offer to shop for that something special or for someone special. We have 5 beautifully appointed en-suite bedrooms, 3 standard rooms and 2 superior rooms for the discerning traveller or businessman. Expect a contemporary design with a service to make you feel special, at home and away from it all. Enjoy a special breakfast with us, take a tour, relax around the pool, get a tan or languish in the serenity of our oasis, within a City. Bradley is on hand 24/7 to assist you with tours of all nature, car hire, and restaurant bookings even before you are with us. Our tourist information desk is on hand as you arrive until you leave us. As our saying goes "ARRIVE AS GUEST, LEAVE AS FRIEND AND RETURN AS PART OF OUR FAMILY"
Our 5 bedroom en-suite, are tastefully decorated in a contemporary style offering twin beds or king size at the request of guest. All rooms are served daily by our friendly and helpful team. There are 3 standard rooms situated on ground level and 2 Superior rooms on the first level. Rooms are fully air-conditioned, have guest tea and coffee facilities, Tv, all guest amenities are provided. Standard rooms all have an inter-leading courtyards where one can relax and enjoy the sun, the newly added superior rooms are spacious with luxury bathrooms and walk-in rain showers. The on premises salon is for guest enjoyment, operating hours are 09h00am until 16h00pm Tuesdays to Saturday early booking is essential. Breakfast is served daily between 07h00am and 10h30am, in the dining area or Alfresco on the patio. There are many Restaurants with-in walking distance. For those who prefer a relaxed dinner at home, we can arrange this with the chef. Dinner by arrangement. Airport transfers are arranged by the guest house, please advise accordingly. From Cape Town International Airport, take the N2 Motorway towards the centre of Cape Town (approximately 20 minutes). Towards the centre of Cape Town, (approximately 20 minutes). When you reach Cape Town, the mountain will be on your left hand side and you will pass Groote Schuur Hospital on the right. Keep in the right hand lane. The N2 splits into Eastern Boulevard (right) and the M3. Take the Eastern Boulevard and follow it right around, pass the City on your left and Table Bay on your right (keep in the middle lane). You will eventually come to a large junction, with a traffic light. (Coen Steytler to the left and The Waterfront on your right). Cross over this junction and turn right at the 2nd set of traffic light into Somerset Road - the M61. Drive down Somerset Road through 5 sets of traffic lights (3 road junctions, 2 pedestrian lights). After the fifth set, on your left turn into Wigtown Road. At the stop street turn right into Sydney Street. At the next stop street turn right into Pine Road and you will see Point B on your left. You may park in the driveway if there are no cars already in it; alternatively, parking in Sydney Road is free. You provide hunting safaris at your establishment? Detail description : Nestled between Signal Hill and the sea, Point B Guest House offers a lovely respite in the heart of Cape Town. Centrally located in Green Point, this home away from home is a short stroll away from Green Point Park and Cape Town Stadium, the beach promenade, and a wonderful array of eateries and attractions. The V&A waterfront and the Zeitz Museum of Contemporary Art Africa are mere minutes away, and views from Table Mountain or reveries in the Kirstenbosch National Botanical Gardens are easily accessible, along with a host of other memorable outings you will happily reflect on while spending time relaxing at our cozy poolside patio. The Guest House has two luxury rooms and three standard rooms. Each room has an en-suite bathroom, flat screen television, a safe, and air conditioning. Other amenities include free Wi-Fi, complimentary coffee, tea, water, and fresh fruit. Savour gourmet offerings each morning, including a freshly made traditional breakfast, prepared by warm and pleasant staff that views you as family. Whether your perfect day in Cape Town features a contemplative sojourn to Robben Island or your perfect night involves exploring restaurants on Bree Street and enjoying the nightlife on Long street, our Guest House offers you the perfect location from which to make lasting holiday memories. We welcome you to be delighted, to be at ease, to be at home in Cape Town. We welcome you to Point B. 11628 page views since 03 Aug, 2012.